This poem raises some interesting questions about the "modern" worldview as it wrestles with angels, and spiritual realities in general. In the opening verse, although Milosz asserts that he believes in the "messengers" or angels, it's also speaks from a thoroughly modern viewpoint. First, he points out the process of demythologizing, the stripping away of tangibility from the notion of angels in modern consciousness: "All was taken away from you: white dresses, / wings, even existence." When Milosz proclaims "Yet I believe in you, messengers," he knows he is making a bold statement. Because of modern sensibilities, it is assumed that one does not believe in angels, at least not publicly among intellectuals. What would have been, in past centuries, a bland statement of belief, reads as startlingly sincere, maybe even intentionally naive in a modern poem. 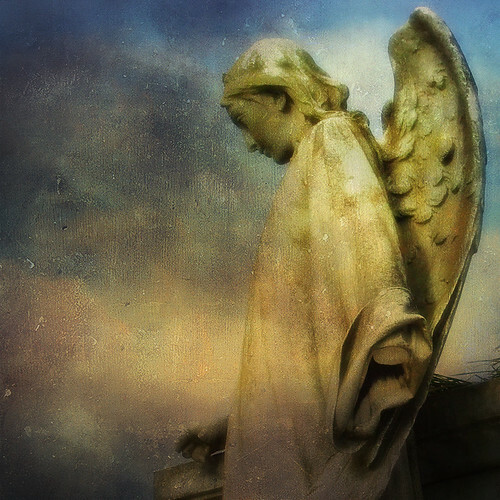 In the modern worldview, angels have been relegated to neurotic Freudian projections. Or, more generously, they might be thought of as universal Jungian archetypes. But they are no longer allowed to live and breathe outside the human psyche. --that's modern too. Questioning the literalness of wings on angels, playfully accepting the notion with the obvious assumption that most modern people would not. Even the parenthetic construction, the way it causes us as readers to stumble for a moment and pick our way through the line more carefully, that also reflects modern sensibility. Although Czeslaw Milosz is a modern poet writing for a modern audience, what isn't modern is his internal quiet. The modern mind is too often caught in staccato details, yet gently filling this entire poem is a sense of rest, self-acceptance, wholeness, even timelessness. This poem quietly glows. When we adopt Milosz's stillness and learn to truly pay attention, we might just feel the brush of angel wings "in the smell of apples at close of day / when the light makes the orchards magic."